Global Calculator | How is the temperature change estimated? How is the temperature change estimated? The temperature change in 2100 is estimated by combining the effects of four greenhouse gases: carbon dioxide (CO2), methane (CH4), nitrous oxide (N2O) and sulphur dioxide (SO2). CO2 stays in the atmosphere for a long time, so it is the cumulative amount of CO2 in the atmosphere that is important, not the rate of emission. The effect of CO2 is estimated by referring to the IPCC's climate model results, summarised in Figure SPM-10 of the Working Group I Summary for Policymakers (right). The grey shaded area gives an estimate of the range of temperature change resulting from each level of cumulative CO2 emissions. The effect of CH4, N2O and SO2 are each estimated using the Global Temperature Potentials (GTPs) of these gases, because they have shorter atmospheric lifetimes than CO2. The Global Calculator tracks emissions of each gas on a 5-yearly basis, and the GTP gives an estimate of the net effect of the emissions at each time point. These are summed to give a total temperature contribution in 2100. The total amount of warming is estimated by adding together the effects of CO2, CH4, N2O and SO2. This is a simplification. In practice, the effects are unlikely to be fully linear, and of course there are other greenhouse gases and important earth system processes which will also affect the temperature. Therefore, the output from the Global Calculator should only be considered a rough estimate. A full climate model simulation of your pathway would give more detailed information, but this would require a lot of computer power to run. Because no climate model is perfect, the uncertainty range is then extended to take into account the possible effect of other physical processes which are not yet included in climate models. This uses a method similar to the one used in the most recent IPCC report. 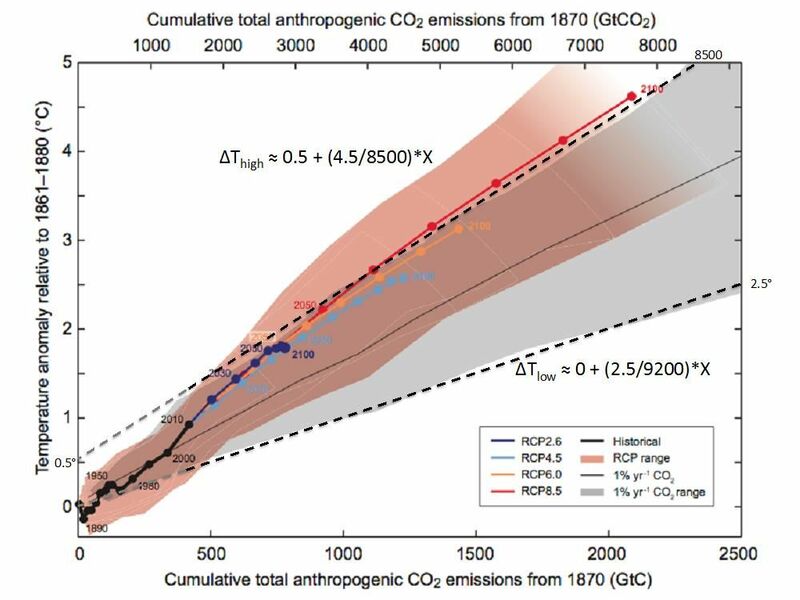 Why doesn't it give a result for high emissions pathways? Most simulations of the global economy do not reach such high levels of emissions, and they are considered to be unrealistic. If you have produced a very high emissions pathway, consider whether there may be cost or resource limitations not included by the Global Calculator. Climate models are tested against observations of current and past climates, so we have confidence in the results when there are small changes. However for very large or very rapid climate change, it is likely that other processes and feedbacks will become important which are not currently well understood or well studied, because we have not yet experienced them. Therefore there is larger uncertainty about possible changes at these levels of emissions, and greater risk of unpredictable changes. A fuller description of how the Global Calculator estimates temperature change, and the role of the "confidence in models" lever, can be found in the detailed documentation.